Any site has its high-risk areas. A high-voltage unit perhaps, or hazardous substances that may be present. Smoking or making phone calls may not be allowed. 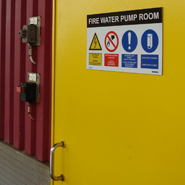 Information about hazardous working situations can be given by single or composite signs. 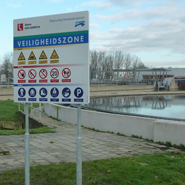 If multiple hazards, prohibitions or instructions have to be communicated, composite signs are the most effective. 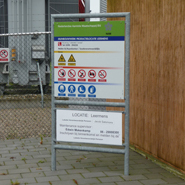 These combined signs inform the employees, contractors and visitors about hazards, prohibitions or instructions. The information is arranged accessibly on a sign designed to fit the situation. It is possible to provide that information together with corporate branding elements; however, corporate branding usage is always subordinate to the safety message. The order in which the items are listed on any sign is in descending order of importance. First the hazard symbols, then the prohibitions and finally the mandatory instructions, in accordance with the ISO 3864 guidelines. These are then followed by any additional information such as a substance identification number, or a reference to the nature of the area such as a compressor room, process area or high-voltage area. 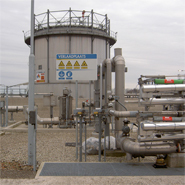 Blomsma Signs & Safety also pays a great deal of attention to the use of materials for the signs in relation to their use and location in the environment. We primarily use high-quality retro-reflective foils to increase the visibility of the signs considerably, both during the day and at night.